Ask fellow campers about "Creekview Campground" and nearby attractions. This is a very small campground, which I only located through this website! It's a huge grassy area with some trees and a nice creek. There are some low branches on the drive that need to be trimmed, and some of the turf is soft after a rain, so I don't think I'd stay here when it might be wet. I didn't use their bathroom, but my husband did, and he said his was pretty dirty. There's a small, old building with one small room each for men and women. The owners were friendly. Easy off and on the highway. No wifi, but OK Verizon signal for data. Good place for overnight. We camped at Creekview Campground in a Motorhome. This is a very tight campground with a 39' motorhome but I didn't really have any problem getting in or navigating the park. We were on site 9 and it fit our motorhome well and satellite reception with a front roof mounted dish also worked well. Verizon cell reception was good. I did look into the shower facilities and they couldn't pay me to use it. We always use our own shower. The interstate was on the other side of the golf course but the noise wasn't objectionable. The golf course is no longer owned by the campground owners. The way the dump is situated I had to back up a short steep hill to use it but again I didn't have a problem. The view of the little creek, pond and golf course was nice. The view the other way with the barn foundation and a junk trailer parked in it wasn't good. If we are in the area we will stay in this park again if still open. We camped at Creekview Campground in a Motorhome. This was a good area for visiting Madison, House on the Rocks and other little historic towns in the area. If you like to visit caves, the Cave of the Mounds was very disappointing. Very little decoration and $18 per person with no senior discount. The interior of the capital is beautiful. We saw a sign on I-90 for this campground late one afternoon and decided to stop. The campground is actually in the village of Albion and is part of the owner's development of their family farm, along with a par 3 golf course just to the north. The campground is pretty rustic, the sites are all grass, and the road is gravel, but the hookups worked well. The noise from the nearby interstate was noticeable, but the lack of many other campers on the night we were there and the rural scene--creek, pond, foundation of the barn, open meadow, big trees along the creek--more than made up for it. We would stay here again if we happened to be in the area. We camped at Creekview Campground in a Fifth Wheel. 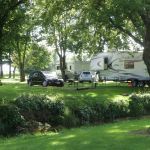 Are you affiliated with Creekview Campground ?